A new Maya & Miguel airs February 13. Maya & Miguel - "Cupid"
Miguel hates Valentine's Day and considers it a greeting card holiday. Maya loves Valentine's Day and considers it an opportunity to tell your loved ones how much you care about them. As Maya prepares herself for the best Valentine's Day ever, Miguel is horrified to learn that he has been chosen as the official Cupid of the school this year, and must deliver valentines throughout the school, attired in cupid wings. He begs and pleads with anyone and everyone to take over his job, to no avail. He straps on the wings and begins halfheartedly delivering the valentines to thrilled students throughout the school. At the end of the day, he tosses the whole getup in the trash, eager to be done with this accursed holiday. 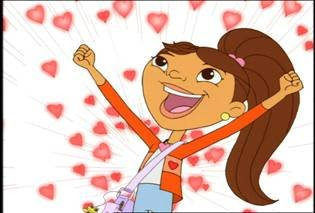 Maya, meanwhile, thinks Miguel is lucky to be able to deliver so much happiness and joy, and gets the idea to start a free valentine’s delivery service for the rest of the neighborhood. Unfortunately, her helper Paco manages to stuff the wrong valentines into the wrong envelopes, and all the valentines are delivered to the wrong people, with insulting results. Soon a mob confronts Maya. Miguel, seeing the mob, digs his cupid wings out of the trash and hops into action to save his sister. In the end, the once angry neighbors are thrilled with the job Miguel does of spreading Valentine's Day cheer... and Miguel's heart grows a few sizes towards the holiday he once hated. Check out the fun Maya & Miguel activities at PBS. Oh, cute! I don't think my little girl has ever watched that show, I'll have to check it out! Fun with Noggin and Nick Jr.